Lufia: The Ruins of Lore, known in Japan as Estpolis Gaiden: Chinmoku no Iseki (エストポリス外伝　沈黙の遺跡, Estpolis Gaiden: Chinmoku no Iseki? lit. Supplementary Biography Estpolis: The Ruins of Silence), is a console role-playing game developed by Atelier Double and published by Taito in Japan in 2002 and by Atlus a year later in North America. It is the fourth title in the Lufia series of video games and was released as a "gaiden", or side story, to the main series; as a result, it does not feature many elements common to the rest of the series, such as the Sinistrals or the DualBlade. 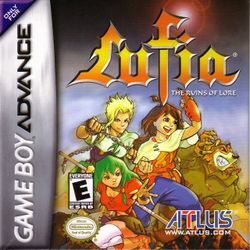 Lufia: The Ruins of Lore takes place 20 years after the events of Lufia II: Rise of the Sinistrals, making it the second game in the series chronologically. After the defeat of the Sinistrals by Maxim, the world has enjoyed a season of relative peace. However, this is threatened when the Kingdom of Gratze, a growing military superpower, allies itself with a mysterious man named Ragule and declared war on its bordering nations. Their primary goal is to scour the world in search of a powerful monster known simply as "The Beast", that, once under their control, would all but insure their conquest of the world. The game is told from the perspective of a young man named Eldin, who, during this age of conflict is traveling the world in search of adventure and intrigue. On his journey, he meets a young priestess named Rubius who is searching for mystic shards and stones that will allow her to enter a fabled holy land. One of the places she needs to go to obtain one is Ragule's fortress, and once they arrive, they meet the despot and realize that if the world is ever to be at peace again, he must be stopped at any cost. This page was last edited on 24 September 2009, at 16:03. This page has been accessed 10,482 times.